Son of a Dark Wizard ebook release! I have finally released Son of a Dark Wizard as a free ebook on Smashwords! It’s also on Amazon Kindle! A CreateSpace print-on-demand physical version is also almost ready. I’m just waiting for the proof to arrive in the mail, and then I’m sure I’ll tweak some things. There are still some other things I need to do to get my whole “indie-published author” brand setup online. I’ve claimed a Goodreads author page, which I’m waiting for approval for. I need a nice photo of myself taken to upload to various sites. I need to create an Amazon author page. I need to redesign the Morrowgrand website. On my Facebook page, I changed myself from being a “musician / composer” to being an “author”, which I hope won’t too greatly anger the few people who’ve followed the page for my music. I’ll admit this whole attempt at indie-publishing is a bit awkward. For example, you’ll notice that I refer to it as “indie-publishing” rather than “self-publishing”; even though they’re the same thing, the latter term is, for me, still tainted with the connotation of a wannabe author’s failure to find an agent. (Or perhaps I should say impatience with finding an agent?) Then there’s the issue of how “promotey” I should be; blathering about my fiction can feel like I’m trying too hard to get attention. (I guess that’s always a weird feeling when you’re trying to promote yourself.) And finally there’s that disconcerting feeling I get as I browse the competition, as I look through other people’s self-published books. It’s easy to feel hints of fear and doubt. Can my work actually compete with the established indie authors and popular books that are doing well? Is my storytelling actually as awful as some other self-published work out there? Will my work simply get lost and buried in the vast competition? At the same time, though, there are indie-publishing success stories out there, and the rational part of my mind says there’s really no reason I shouldn’t be one of them if I can just be thoughtful, persistent, and patient enough. Anyway, I’ll continue to work on these various author-online-brand things over the weekend. Then I should finally be able to get back to some writing projects! For comparison, here is the rather crude illustration I drew to let artist Jonas Akerlund know what I was going for. 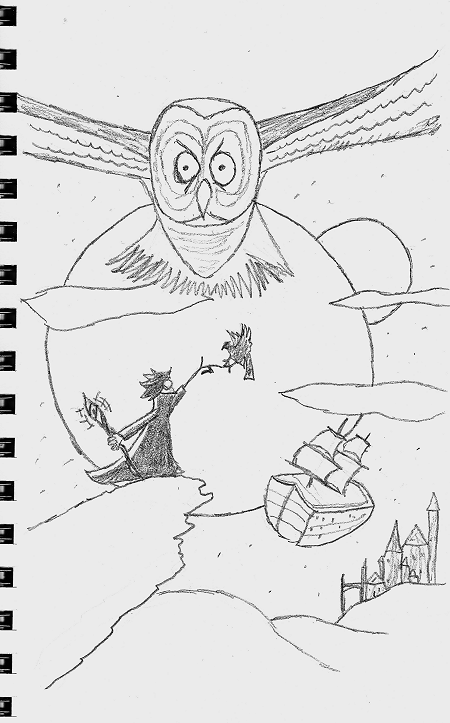 My drawing is bad, but all the elements are there: the main character, his raven, the owl, the moons, the castle, the airship. The awesome artist Jonas was able to take this and a written description and turn it into the fantastically epic illustration above. I’m currently eyeing January 2nd, 2015 (two weeks from today) as the release date. Son of a Dark Wizard gets an illustrated cover! I recently commissioned an illustration for my forthcoming book Son of a Dark Wizard from artist Jonas Akerlund. I’m not revealing the cover illustration in this particular blog post, but I’ll post it here soon; I just have to work on the title lettering for it. You can rest assured, though, that it looks appropriately mysterious and fantastical. I’m very excited to have it as the cover! I’m hoping it will generate some “hmmm-that-looks-interesting” thumbnail clicks. Since this will mark my first foray into wildly-competitive world of indie-publishing, I’m hoping it will help make a good first impression with book browsers. The book itself will be officially released some time in January. (It’ll be mostly the same as the draft posted now on Morrowgrand, with some minor edits. I’ll remove that draft when the book’s released, though, especially since the whole Morrowgrand website needs to be redesigned. As it really only needs to host product information pages, I don’t think a full-blown WordPress installation is necessary.) As I’ve said before, as the first of a series, the book will be free. (Well, at least free on Smashwords; Amazon’s Kindle publishing won’t let you make it free.) My intent with this novel is not so much to make a profit as it is to help me start building an audience. I know earning a regular income from indie-publishing will take time. As for the accompanying soundtrack, it might take a bit longer. I have all the main themes written, but I want to do more experimentation in terms of harmony and orchestration and really try to expand my musical palette. Not sure how successful I’ll be, but I figure it’s worth taking my time on. So check back soon to see the cover! In the meantime, enjoy the holiday season! 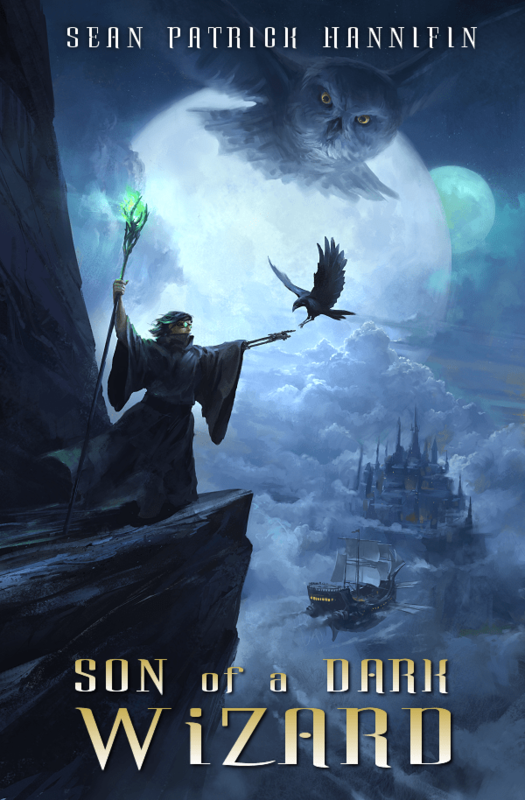 I have started posting my upper middle grade fantasy novel, Son of a Dark Wizard (previously referred to as The Dark Wizard) over on Morrowgrand. Summary: Thirteen year old Prince Sorren may have survived the vicious attack on his castle, but the young wizard’s life is left in ruins. His father’s been assassinated, he was forced to flee his castle, and he lost his left arm. But after using his powers to build himself a fully-functioning mechanical arm, he’s ready to take back his throne. He doesn’t care if his father’s assassin is a boy believed to be the Chosen One, or if the prophecy that foretold his father’s death also calls for his own death at the same boy’s hands. He steals an airship and sets sail in search of the boy, eager to battle the Chosen One face to face. But when he’s almost killed by the weapon the Chosen One possesses, Sorren realizes even a dark wizard’s powers are no match for what he’s up against. Pretending to be a powerless traveler, Sorren explores a forest called Owl’s Grave, where lives the small community of outcasts that raised the Chosen One. With the Chosen One determined to fulfill the prophecy by killing Sorren and taking over the kingdom, Sorren will have to look beyond his power if he’s to have any chance of defeating the boy who destroyed his life. And the answer he’s looking for is probably right under his nose, there in Owl’s Grave, if only he can find it before the Chosen One finds him. I don’t expect many (if any) readers to actually read the novel as I post it to Morrowgrand, but if by chance anyone does and finds any typos, grammatical errors, continuity issues, etc., it would be awesome if you could email such feedback to me at seanthebest(at)gmail(dot)com. If you do, I’ll acknowledge your name in the ebook / physical book, and mail you a free copy of the physical book along with a CD of the score as a thank you (when they’re ready for release). My current plan is to release the entire novel on Morrowgrand, chapter by chapter. Then I’ll release a free ebook to places like Smashwords, followed by a companion musical score, which I’ll upload to bandcamp and release a physical CD (probably through Kunaki or a similar low-run CD replication service). Finally, I’ll release a physical copy of the book through CreateSpace. As I impatiently wait for responses from potential agents regarding the last novel I finished, The Dark Wizard, I wanted to see what some of my other stories might look like in book form. 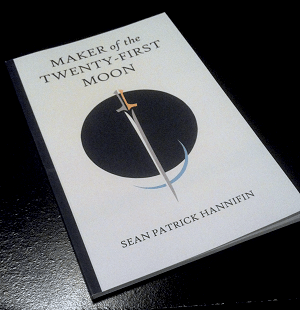 I gathered three of my short stories, Maker of the Twenty-first Moon, The Final Dream of Samuel Shadows, and No One Was Abendsen, formatted them into a small 42-page book, and had it printed by Amazon’s CreateSpace. 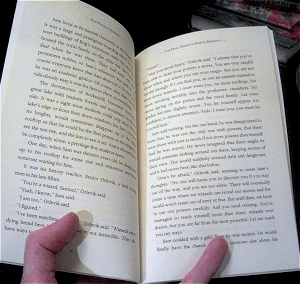 I wanted to see what CreateSpace’s book quality was like, and I enjoy the idea of having my stories on paper for my personal collection. It’s very short; altogether the three stories are only around 9K or 10K words, so having it printed just for myself only cost $5.85; about $2.50 or so for the book itself, and the rest for shipping. I thought that was a fine price for having my stories printed up all fancy for my bookshelf. So this small collection of stories is now for sale on Amazon. The title story was first published by Daily Science Fiction in 2010, but the other two stories were never published. Of course, I don’t expect to sell many copies, if any at all. There’s really no market for short stories from unknown authors. But, in my opinion, it was worth the effort just to get a nice copy for myself. From now on, I think I’ll do this with all my stories. Most of the process is pretty easy, as long as you have the know-how to format something in MS Word or some other word processor. The hardest part for me was probably designing the cover. I’m no artist, so I decided on something very simple and iconic: a sword piercing a crescent moon, with a big circle behind them both for some contrast. I drew it in Manga Studio with an Intuos tablet and then imported the image into Photoshop, where I designed the titles and the rest. It took almost an entire day to get the shapes of the image right; as I said, I’m no artist. Unfortunately, as a thumbnail on Amazon, it really doesn’t “pop” like a good cover design should, so it probably won’t attract much attention. But I really love the way it looks in print. Next, I think I’ll do same sort of thing with an unpublished 11K-word novelette I wrote back in 2009 called Dreamgiver. 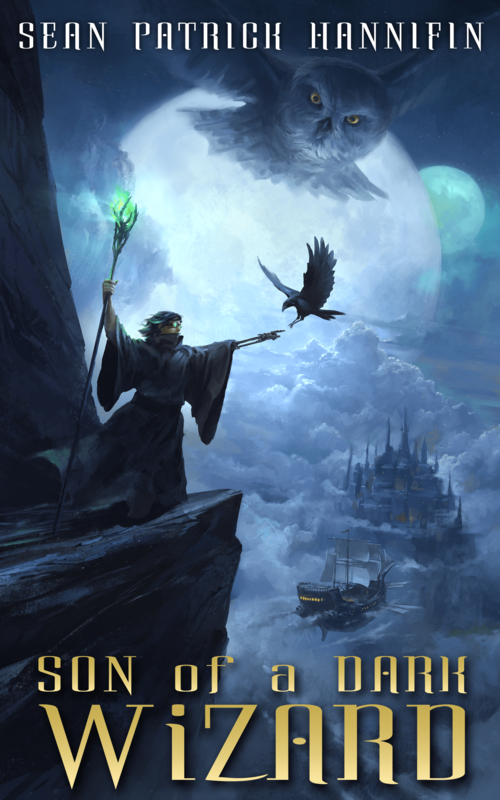 For the new fantasy series, I’m revisiting the novel I finished in 2013: Moonrise Ink. More accurately, I’m creating a completely new story in a new world with a new magic system while heavily borrowing my favorite elements from Moonrise Ink, including its main characters and its title, which will be the title of the series. I’m still in the planning stage, which is of course the most awesome and exciting stage of story creating. My current plan is to publish twelve installments of the series, one every month (which I’m sure I won’t be able to stick too, because I’m such a slow writer, but I’m telling myself that that’s the plan to inspire myself), each of which will be at least 30K words. Each installment will be $2.99, and then every three or four months I’ll put out “collection” editions that will collect a set of three or four installments. As a bonus, I’m also hoping to compose a soundtrack or two for the series. Because that would be awesome. I think. This might be too ambitious for me to pull off, but I really need to plunge into a project like this, because waiting for agent responses is making me very restless. I haven’t updated in months, have I? Here’s a little update on how my writing not-yet-money-making-career is going. My agent search for my middle grade fantasy novel Moonrise Ink was unsuccessful. I got a few requests for partials, one request for the full manuscript, but they all ultimately ended in rejections. There are plenty more agents I could try querying, but in all honesty, I’ve lost faith in the book. Now that I have some distance from the manuscript, I can see some terrible weaknesses. Firstly, the main character, Quoll, is not active enough, which makes him dull to read about. Secondly, the enemies that Quoll is supposed to be fighting remain elusive for far too long, so we have what Blake Snyder would call a “watch out for that glacier!” problem. Or perhaps in my case, “where is that glacier anyway? I can’t even see it.” In the second half of the book, I think it become apparent that I grow bored with Quoll and find much more interest in the supporting character Thravien and his subplot of betrayal. But rather than compensating for Quoll’s character weaknesses, it only further tilts the story out of balance. There are other critiques I could mention, but those are the main ones. They are fixable, but fixing them would require a lot of restructuring and rewriting, and I’m more interested in moving on to new stories with new characters in new worlds. As I mentioned to a friend a few weeks ago, I am very good at reading a story or watching a film and recognizing and understanding the underlying structure of the plot. But going in reverse, creating the structure and fleshing it out, especially for something the length of a novel, is still a challenge. Understanding how the emotions and pacing of each scene relate to the overall plot structure is something that will take time and experience, I suppose. I know I certainly didn’t quite get it with Moonrise Ink. I am now working on a middle grade fantasy novel which I will call, for the time being, The Dark Wizard. (That really won’t be it.) What better way to make sure that my main character is active than to make him a young villain, eh? I’ve been wanting to write this character’s story for a while, though it took me many months to come up with a plot I felt was appropriate. There are still challenges I’m facing with this story, of course, but I’m definitely enjoying writing a darker fantasy, especially around this season. My first draft is currently around 6,200 words with 4 chapters. I’m aiming for 30,000 to 40,000 words with 20 or so chapters. I’m definitely trying to keep it much shorter than the 79,000 word manuscript for Moonrise Ink. I’m also reusing some of the fantasy elements I really enjoyed using in Moonrise Ink, so things like toves and the blue Nyrish moon won’t die just yet. I’m also still working on the co-written supernatural fantasy with a friend. Progress is much slower on that, but I think that’s inevitable in our situation. However, I’m very much enjoying it; even when we disagree on something, the disagreements are engaging and, whether or not I end up changing my mind, they force me to think of things differently. Oh, I almost forgot to mention, my short story Arkbod appeared in Buzzy Mag last month! Be sure to check it out! I’ve decided to post the first chapter of the novel I’ve been working on, Moonrise Ink, here on this blog for free. I hope to interest potential readers, and perhaps attract the attention of agents and publishers. I read on the Internets that agents and publishers are constantly scouring blogs for potential writers to publish because so many amazing writers are just too nervous to submit their work. So here it is, chapter one of Moonrise Ink! I think you will like it and want to read the whole thing when it gets professionally published! Little did little Quoll know that he was the Chosen One, chosen to fulfill the mysterious prophecy. It began in the Kingdom of Tumblebridge Ek’lirywin’tkt. There, the sky was a dark violet for a thousand years, when people suffered under the reign of the terrible King Uoook, who enslaved many men. His teeth were as sharp as the teeths of wolves, and covered in the blood of the animals he ate because he was evil. Some called him the Dark Lord, others called him the Dark One, and still others called him He Who’s Name Must Not Be Uttered. The people who were not enslaved were so afraid of him that they stayed in their homes at all times, coming out only in the dead of night to tend to their gardens and yardwork. How anybody managed to live through these dark and evil times nobody knows. The lands had been plagued by war and suffering before then. The plague of the Ravishing Sickness had left the lands as black as ash. When the grasses returned, legend had it that it was because the tears of the slaves had watered the lands back to a normal water saturation level. But most legends were dark and forbidden. The Dark Lord always had his way. Always. He had his way because he was the holder of the Black Sword of the Dark Moon. With this sword, he had control over the world. He only had to point his sword at the moon and moon power flowed into him so passionately, like music from the devils. For a thousand years he ruled the lands, but then he fell. His power was broken by the most unlikeliest of creatures: an elf named Squiggley the Brave from the mysterious lands of H’kdk’burger. But how the elf defeated the dark lord remained a secret. And then it became legend, and then myth, and then a lie, and then a thought, and then it was almost nothing at all but a story lost in a book that nobody ever read. But the elf died not a silent death. For on his death day, he uttered words nobody then understood. He said: “Let it be known to the world that I did not kill the Dark One. No. I only killed an incarnation. He will return. Heed my words! Heed them, I say! For the Dark One will rise again! And only one can defeat him. A young poor boy from a farm named . . .” But then he died before he said the name, leaving all those around him to speculate and guess at what his name might be. Well, his name was Quoll. But Quoll didn’t know he was the Chosen One. For all he knew, he was just a normal boy on a farm who was poor and had to do farm work, day after day, until his hands were bloody with blisters and his body was tired with strain. One day, Quoll was picking tomatos. That’s when the storms came. Metaphorical storms, that is, for a knight with his stormish army came to the farm and asked for food. “We have very little food,” Quoll said. “Only nine tomatos. But come in, rest, and I will share. For what else can we do in these dark times?” For the times had once again become really dark and sad. “Thank you,” the knight said. “You are a very good boy to be so kind and to help us.” And so the knight and his army crowded into Quoll’s farm and ate their fill. As dead as could be. Quoll jumped onto his Papa and cried bitter tears. They dropped from his eyes like stones or like shards of glass. It was the blackest darkest day Quoll had ever experienced. Who could have done this dark deed? Quoll’s eyes looked to the skies. He felt the need for revenge in his heart, and he knew his quest had only just begun. It was be a long quest, full of darkness and danger, but in the end he had to fight for what was right because that’s what was really important. And the price might be his life, but he would pay the price, because he had to, because it would be the right thing to do. “Today I start my quest!” Quoll said, rising from his father’s corpse. Meanwhile, down below on the first floor, something was happening. Something that would shape Quoll’s life in a way he would never expect. It was the knight who had asked for a meal. This knight was called Hibble. Hibble sat there, eating a tomato, but inside his head were thoughts. Thoughts that could not be undone. First he thought of the dark times, the times when the Dark One ruled the lands. Hibble knew the Dark One would return and that there was a prophecy. And know Hibble knew who the Chosen One was. It was Quoll. Hibble knew. He didn’t know how he knew. He could just feel it, like a shifting of the winds. There was a purity in Quoll, a purity that was a strength, a strength that was a promise, a promise that was a secret, a secret that was a key, a key to the truth of the prophecy. And so Quoll and Hibble and the rest of the army left the farm and journeyed into the dark shadows of the world. I don’t want to sound too proud, but I get goosebumps every time I read this opening chapter of mine! Thanks for reading! My short story Maker of the Twenty-first Moon appears in Not Just Rockets and Robots: Daily Science Fiction Year One. Daily Science Fiction publishes a story every weekday, and this book collects all the stories from their entire first year. The resulting book is 871 pages of science fiction, fantasy, slipstream; 260 or so stories to entertain and possibly even make you think. At more than 425,000 words, it’s more than 4 good-sized novels worth of fiction. I got my copy last week. It’s wonderful for someone like me who prefers to read on paper.